The summer-only loco-hauled services on the Ceske Budejovice - Nove Udoli line were supposed to be worked by class 754s this year but they hadn’t taken over completely when I visited the line for three days over the May Day holiday. Much to my surprise, class 749s were still in charge of half the loco-hauled trains on this very scenic line that runs into the heart of the Sumava. A visit to two more Czech lines either side of a second trip to Slovakia in late April and early May 2011. This time I visited the Liberec - Frydlant - Zawidow line, where class 753.7s haul heavy freights through the Jizerske Hory mountains, and the Sumperk - Hanusovice - Jesenik line, another scenic route with class 754s on passengers and class 751s on freight. This report covers a ten day photographic trip to the Czech Republic in September 2010. Much of the trip was spent on the Hanusovice - Jesenik line where class 754s were taking over but class 749s were still in evidence. The 754 worked Brno - Jihlava, Brno - Veseli, Stare Mesto - Luhacovice and Jaromer - Trutnov lines were also visited. It was time to try to fill some of the gaps in my electric coverage. Usti nad Labem is a busy centre for freight and passenger traffic, with a good variety of loco classes and types of traffic and some excellent photo locations nearby. I spent four days there but my plans were scuppered by the weather and I spent most of the time exploring. As a result, this report is more of a description of the lines ridden than of the photographic locations visited. This trip was designed to fill in a few gaps in my coverage of Czech diesel lines around Praha and from Nymburk to Mlada Boleslav with the emphasis on freights. There was also the compulsory visit to the fabulous Jesenik line, Olomouc - Unicov, Brno - Veseli, Zdar - Tisnov and even the electrified main line near Pardudice. Three lines converge on Volary, a small town in the heart of the Sumava, the mountainous region in the south-west of the Czech Republic that borders Germany and Austria. There are a couple of freights that run all year round and, in summer, when tourists flock to the area, there are a few loco hauled passengers as well. Volary had been on my list of places to visit for a long time and I finally got round to going there from 5 to 9 August 2009. It had been almost two years since I’d photographed at Praha hl.n. and in the meantime, the new northern approaches have been completed and the platforms under the overall roof have been rebuilt. The station is at its best in the morning and evening light so the long days of early July seemed a good time for a return visit. I had also hoped to photograph some diesel hauled freights in the Kladno and Kralupy areas, north of Praha, and on the Nymburk – Mlada Boleslav line but that didn’t work out. It had been a whole year since my last visit to CDland and, as usual, quite a few operations had changed in the meantime, not all for the worse either. This trip combined some of the new opportunities, both diesel and electric, with return visits to a few old favourites and filling in some gaps in my photographic coverage. The main aim of this 20-day trip was to fill in some gaps in my coverage of Czech diesel worked lines. In the event. I couldn't resist revisiting some old favourites as well. My travels took me to the Brno area then on to Ostrava for class 754s, to the Jesenik line for class 749s, 751s and old railcars, more 754s around Trutnov and finally the 753 hauled freights around Liberec. This report covers a two week photographic trip to the Czech Republic in autumn 2007, visiting four rather different diesel and electric lines across the country. 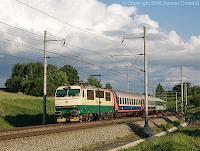 I started with the loco hauled weekend trains on the scenic line from Praha to Cercany before moving on to Olomouc where some old class 141 electrics are enjoying a new lease of life. Next on the agenda was the Jaromer - Trutnov line with its diesel hauled fast passengers. The trip ended with an old favourite, the Karlovy Vary - Chomutov line, my first visit there since electrification. Class 753 diesels disappeared from most parts of the Czech system several years ago but Liberec depot has kept a handful in service for working freights on the scenic line to Zawidow in Poland. This report covers a short trip to the area in late summer 2007. It had been a couple of years since I’d visited the Tyniste nad Orlici – Mezimesti line in the north of the Czech Republic but an increase in the number of freight trains prompted a return visit in June 2007. There was also the opportunity for a first visit to the nearby Jaromer – Trutnov line, which now has regular loco hauled fast passenger trains and turned out to have a lot of photographic potential. A final visit to the scenic Letohrad - Lichkov line before electrification work started. This was one of the few routes left with diesel hauled heavy freight traffic and recent vegetation clearance had made it a real photographic treat. Four days were also spent on the splendid Hanusovice - Jesenik line, which has seen a resurgence of loco haulage this year. This report describes a short spur-of-the-moment trip to the Czech Republic. The intention was to spend 3 days on the Brno - Jihlava line, a route with a reasonable level of locomotive haulage, nice scenery and plenty of open locations suitable for low winter sunshine. In the event there was no sun so most of the time was spent travelling around, checking out photo opportunities and covering new track. The Hanusovice - Jesenik line in Northern Moravia was always a top priority for a return visit after my first trip there in April this year. It's a superb piece of railway with good scenery, a variety of traction including vintage class 831 and 851 railcars, a few class 749 hauled passengers and freights worked by unsilenced class 751s, several of which carry a glorious red and blue livery. Praha is the hub of the Czech rail system and sees a variety of classes working heavy freight and passenger traffic on the electrified main lines radiating from the city. A few less heavily trafficked lines are still diesel worked and see some loco haulage. This report describes a photographic trip to the city in late June 2006. A short trip to Ceska Trebova on the busy electrified main line from Praha to Ostrava and Brno. Lots of electric action from an impressive variety of classes on freight, local and long distance passenger trains. 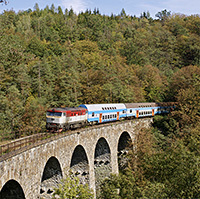 A two-week trip concentrating on the scenic Hanusovice - Jesenik and Letohrad - Lichkov lines in the hills of the north-eastern Czech Republic where class 749s and 751 locos mix with old class 831 and 851 railcars. A trip to photograph diesels and electrics in the snow around Ceska Trebova during the January 2006 big freeze when temperatures plummeted well below -20°C. Diesel hauled freight trains are becoming increasingly difficult to find in the Czech Republic but two lines to Poland still carry fairly heavy traffic hauled by double headed diesels. This report details a two week photographic trip to the Letohrad - Miedzylesie line and the Liberec area in early autumn. 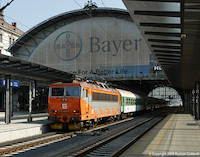 The Brno - Jihlava line is notable for its frequent loco hauled passenger trains and excellent scenery. Brno's colourful fleet of class 754s share passenger duties with class 742s and a selection of railcars, some more acceptable than others. Sometimes the weather stays dull and wet for days on end and there's nothing to do but travel around, exploring new lines and seeking out new photo locations, while waiting for the clouds to clear. This was such a trip. Plzen's blue, white and yellow class 754 diesels can be found working passenger trains on the line to Domazlice. The line's north-south orientation and the concentration of traffic early and late in the day make it an ideal candidate for a midsummer trip. A wet weekend attempting to photograph trains in Praha. In spite of the poor weather, a few breaks in the cloud did permit a number of reasonable photos, particularly around Praha hlavni nadrazi (main station) with its superb overall roof. In total, more than ten classes of diesel and electric were seen in and around the city, varying from the latest pendolino EMUs to the ageing class 141s. A return visit to the Liberec area to see the last concentration of class 753s at work on freights to Zawidow in Poland. A longer trip to three different, scenic, diesel worked lines in the Czech Republic, starting in the north with the last class 753s working freights in the Liberec area. Then came a visit to see the class 714 and 742 hauled passengers on the Nachod to Mezimesti line, further east, and finally the colourful class 754 worked passengers on the Brno - Veseli nad Moravou main line in the far south. A short trip to the Tisnov area west of Brno, covering the diesel worked line from Tisnov to Zdar nad Sazavou via Bystrice nad Pernstejnem and the electrified Brno to Havlickuv Brod main line.